Thomas M. Lavoie is applications engineering manager at Greenerd Press & Machine Co., Inc., Nashua, NH; www.greenerd.com. 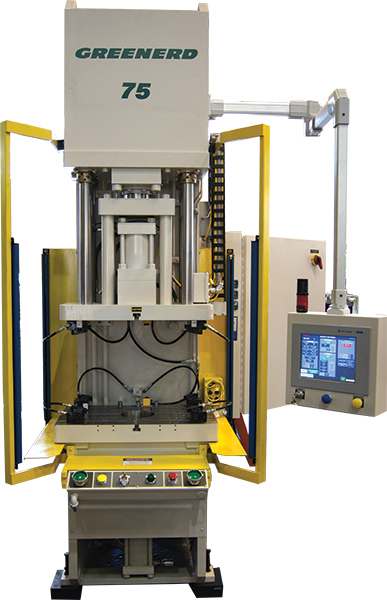 Control upgrades, such as those performed on this 75-ton hydraulic press, can ensure proper die selection and proper job settings. 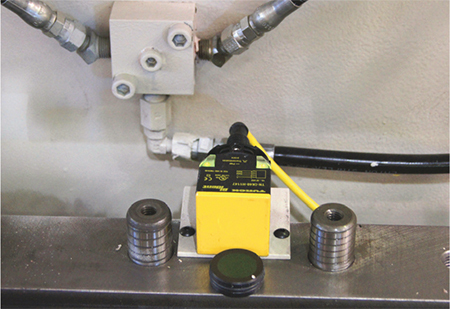 Application of control technology can help presses perform optimally, and provide solutions to vexing problems that often lead to catastrophes. Such was the case for this hydraulic-press user. The metalformer, using a Greenerd C-frame hydraulic press with adjustable tonnage from 15 to 75 tons, needed to solve a couple of issues. The manufacturer sought a way to prevent setup personnel from using the wrong upper- and lower-die combinations, as numerous tools for producing medical devices are similar in design and all use the same-sized die sets. Another concern: The press required the exact same setup for each and every run of the same product. Manual setup made repeatability difficult, with excessive time spent to ensure proper settings for each job. It should be noted that the press’ speed is adjustable from 0.2 to 36 in./min., and features a 35-ton-capacity hydraulic knockout mounted in the end of the main ram along with a 20-ton-capacity cushion under the bed of the press. 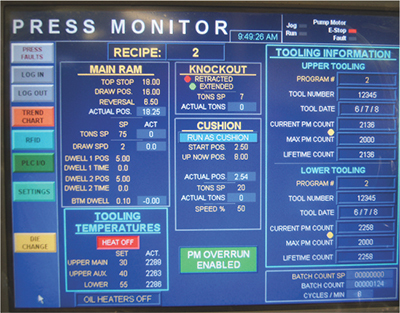 An Allen-Bradley Versa View industrial computer with data-logging capability provides touchscreen control, and the press’ oil tank is equipped with a heater to ensure that oil temperature remain constant, allowing for repeatable pressure control. On several occasions, operators or setup personnel at this metalforming operation would grab the wrong upper- and lower-die combinations to produce a particular part. Not until the first part was made would personnel realize that the upper and lower tooling did not belong together. In some cases, this caused irreparable damage to the tooling, which then required rebuild or repair, and delayed part production. An additional complication: The metalformer used heated dies to aid in forming parts from titanium, so any identifier for individual tools had to withstand temperatures of several hundred degrees. A control upgrade allows a metalformer to adjust, store and recall settings, avoiding the hazards and time costs related to manual setup. Greenerd worked closely with the manufacturer to understand specific tooling issues, and ultimately, both parties agreed that the die halves would be identified with RFID (radio frequency identification) tags, which can withstand the heat associated with part drawing. In addition, these tags store die information that can be used to schedule preventive maintenance. Greenerd also developed a program that allowed each die to be viewed with an RFID reader located on the throat plate of the press. The RFID system sends the die information directly to the control, which calls up the correct program for that particular part run and inputs the proper press settings. A job doesn’t run until the control has read the dies and determined that the die halves match. The upgrade also included installation of a pressure and linear transducer, enabling control of stroke depth and tonnage via the touchscreen. Recipes via these readings then can be stored for future access, ensuring proper settings job after job. 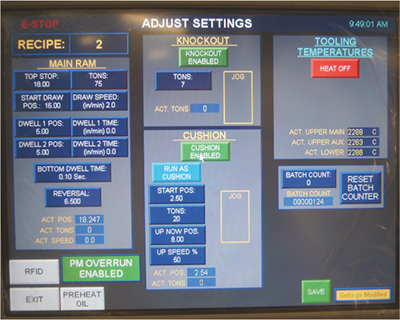 The control touchscreen provides a wealth of job information. Note identification of the die halves on the right of the display. This information is read and fed into the control, which then calls up the proper job settings given those particular tools. The information also allows tracking of die usage and prompts for preventive maintenance. The upgrade also programmed preventive maintenance for each die. The metalformer simply inputs the information necessary for each individual die when setting up the die for the first time. With knowledge on approximately how many strokes can be run on a die before it needs rework, the metalformer programs in the desired number of cycles. The touchscreen warns the user as that cycle number approaches, and then automatically disables press cycling at that number. To prevent continued production using the die, setup personnel must log in and manually override the stoppage. This password-protected feature ensures die health. When production ends, the touchscreen displays the total number of cycles run using the die, and stores this information. It also notifies personnel of the number of useable cycles left on that tool—a low number triggers personnel to remove the die for service. Following maintenance, the control resets the cycle count for that die to zero.